Once you have read http://drocar.xf.cz/the whole cinematography of this cameraman you will agree with me that he is a real master of his art. Miroslav Ondříček has under his belt a huge amount of work. He doesn’t change his opinions, he knows the value of money earned abroad, and he passes on his experience at film schools. He is natural, modest, and ordinary, the way most the people who have proved their skills are. He has never stopped loving his friends, his part of town, football, free time, delicious meals, pleasant gatherings and most of all, his great love – film. Film is the love of his life as well as a hard lot. The shooting of a film can turn into a struggle for life as in Ondříček’s recollections of A League of Their Own. Miroslav Ondříček learnt his trade in the studios of Czechoslovak Film in Barrandov, as he likes to recall. When the director Jan Soukup was making the documentary film Dobrý den pane Ondříčku (Hello Mr Ondříček) he was surrounded by his fellow cameramen and he also suggested using the Barrandov studios. He started his career as a documentary filmmaker, studied at an evening school of film production of Prague’s Academy of Performing Arts and in the year 1956 he participated in the first feature picture as a camera assistant. A film by the director Ivo Toman called Váhavý střelec (The Hesitant Shooter) had its premiere on 7.6.1957. He first worked with the cameraman Jan Čuřík and the architect Karel Černý. It was the first film role for Jan Tříska who played the main character. The screenplay was jointly written by the director Vojtěch Jasný. ‘A short satiric grotesque from the present’ was the slogan of Konec jasnovidce (The End of a Clairvoyant) about the problems of nationalised traders. The hero was a visionary, Mathias Scibolini, played by Miloš Kopecký. The film made in 1957 was another opportunity for Ondříček as an assistant; the directors were Vladimír Svitáček and Ján Roháč. 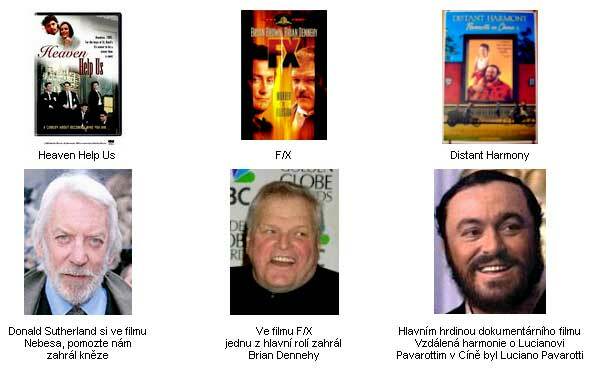 He met many distinguished actors, such as Jiřina Bohdalová, Josef Kemr, Miroslav Horníček, Vladimír Menšík, František Filipovský, Josef Hlinomaz, Stella Zázvorková, Marie Rosolková and Věra Chytilová, the future director, who made a cameo appearance. The architect was Jan Zázvorka, cameraman Jaroslav Tuzar and the music was composed by Jiří Šlitr. Miroslav Ondříček was then a camera assistant in the film Snadný život (An Easy Life) directed by Miloš Makovec. The premiere was on 18.10.1957. Jiří Suchý played a small role and Jiří Brdečka cooperated on the screenplay. In 1958 he worked as a camera assistant on the films Cesta zpátky (The Return Journey) by the director Václav Krška, with the leading role played by Eduard Cupák (premiered on 17.04.1959), Dneska naposled (Last Time Today) by the director Martin Frič, the principal role was played by Zdeněk Štěpánek (premiered on 13.12.1958) and once again Krška’s film Zde jsou lvi (Hic Sunt Leones) (premiered on 08.08.1958) The leading roles were played by Karel Höger and Dana Medřická. He celebrated his 26th birthday on 4.11.1960 at the premiere of a film by František Vláčil Holubice (The Dove), where he participated once again as a camera assistant. The architect and designer was Theodor Pištěk and the editor was Miroslav Hájek. The second work in this year, where he participated in the same function, was a film for children by the director Jan Valášek, Kouzelný den (A Day of Magic) which had its premiere on 24.3.1961. The first time he worked as a second cameraman was in 1961 on the film Králíci ve vysoké trávě (Rabbits in Tall Grass) by the director Václav Gajer, based on a screenplay by Ota Hofman. The picture’s premiere was on 23.2.1962. He had the same function in 1962 making the television programme Střevíčky (Slippers) with Jiřina Jirásková in the leading role. In 1962 he had shot as a camera assistant the film Deštivý den (Rainy Day) directed by Jiří Bělka, with Vlasta Chramostová in the principal role. He made as second cameraman the Vojtěch Jasný´s film Až příjde kocour (The Cassandra Cat) starring Jan Werich in 1963. The premiere was on 20.9.1963. The assistant of the director was Ivan Passer. He was also the second cameraman in Jaromil Jireš´s film Křik (Screaming) based on a story by Ludvík Aškenazy. The premiere was on 14.2.1964. He introduced himself to an audience as an independent cameraman for the first time 14 days later, on 28.02.1964, at the premiere of film Konkurs (The Competition), the debut of the director Miloš Forman. The film lasted 82 minutes and the assistant of the director was Ivan Passer. The film is composed of two short musical stories. The first one tells the story of brass bands (Kdyby ty muziky nebyly) who lack young musicians. The second part shows authentic scenes from a singers’ competition at the theatre Semafor. In the same year he held the second camera again in Jan Němec film Démanty noci (Diamonds of the Night). The premiere was on 25.09.1964. The film was based on a story by Arnošt Lustig. The cameraman was Jaroslav Kučera, the assistant of the director was Hynek Bočan. He worked as the second cameraman on an episodic film in 1965. The film was based on a book of short stories by Bohumil Hrabal, Perličky na dně. The first cameraman was Jaroslav Kučera and there were five directors: Jiří Menzel with the tale Smrt pana Balthazara, Jan Němec with Podvodníci, Evald Schorm with Dům radosti, Věra Chytilová with Automat svět and Jaromil Jireš with Romance. The premiere was on 7.1.1966. Miroslav Ondříček began to work as an independent cameraman and there are many films where his craft comes to the fore. I will remind you of some. In 1965 he was shooting the second film with Miloš Forman, Lásky jedné plavovlásky (Loves of a Blonde). The premiere was on 12.11.1965. It was cooperation of friends of the two filmmakers. The screenplay was written by Miloš Forman with the participation of Jaroslav Papoušek and Ivan Passer (he was also a co-director), Karel Černý was the architect and Miroslav Hájek was the editor. The main characters were played by Vladimír Pucholt and the sister of Forman´s first wife Jana, Hana Brejchová. The film was nominated for an Oscar as the best foreign film of 1967. The British film and theatre director and novelist Lindsay Anderson, the leading light of the Free Cinema movement, debuted with the short film Meet the Pioneers (1948). Five years later he won an Oscar for a documentary about deaf and dumb children, Thursday Children, where Richard Burton participated as the narrator. Anderson’s first feature film This Sporting Life (1963) was very successful at the Karlovy Vary festival and a short time after that Anderson arrived in person to Prague. He visited the set of Loves of a Blonde and offered to Miroslav Ondříček his participation in the film The White Bus. (premiered in 1967) It was the first film experience for Anthony Hopkins who is now a famous Hollywood actor. By coincidence, Lindsay Anderson also directed Hopkins in his first major theatre role as Julius Caesar. After Miroslav Ondříček returned from England, he shot an episodic film, Mučedníci lásky (Martyrs of Love) with the director Jan Němec. The premiere was on 21.4.1967. Ester Krumbachová participated on the screenplay with the director. According to some sources, the British director Lindsay Anderson played a cameo role in this film. In 1967 he met Miloš Forman to shoot another film. Hoří má panenko (The Firemen’s Ball) had its premiere on 15.12.1967. The screenplay was once again the work of Jaroslav Papoušek, Miloš Forman and Ivan Passer. Karel Černý was the architect and Miroslav Hájek was the editor. The film was nominated for Oscar in 1969. If was ‘defeated’ by the Soviet film War and Peace. In 1968 he travelled again to England in order to work with the director Lindsay Anderson for the second time on what was to became one of the British classics. The title was taken from Kipling’s poem If... The principal character was played by Malcolm McDowell. The film received a Grand Prix at the 23rd international film festival in Cannes in 1969. The Czechoslovak premiere took place on 29.12.1972. In this period Miroslav Ondříček shot two musicals. Their director was Ján Roháč. The premiere of the TV film Co nikdy nepochopím (What I’ll Never Understand) with Hana Hegerová was on 5.1.1969. The second the second movie was the recital Pět písní pro Zoru Kolínskou (Five Songs for Zora Kolínská). Zora was the wife of Milan Lasica then. He shot another film in French-Czech coproduction called Tělo Diany (The Body of Diana) with the French director Jean-Louis Richard in 1969. (the Czech premiere was on 14.9.1969) The leading role of the jealous actress was played by the famous French actress Jeanne Moreau. At the beginning of August 1970 he flew to the United States to shoot Taking Off with the director Miloš Forman. This bitter comedy was Forman’s American debut. The main theme was the same as in previous Forman’s Czech films (Black Peter and Loves of a Blonde): the eternal generation gap. ‘We arrived two months before the start of the shooting. The town was covered with snow and we were looking for motives and locations, just walking around. It took us pretty long to find a house where most of the scenes could take place. We had seen about 500 houses and in the end we had chosen a church converted to an apartment. The girl’s dormitory was originally a bell tower. The scenes in the pub were shot in the restaurant of Ája Vrzáňová,’ says Miroslav Ondříček. By 1972 he was back in Czechoslovakia to shoot the last part of the trilogy Homolka a Tobolka about the highs and lows of the Homolka family. Jaroslav Papoušek was the director. The premiere was on 1.10.1972 and as in the previous parts of the trilogy, the leading children’s roles were played by Miloš Forman´s and Věra Křesadlová’s twins Petr and Matěj Forman. Iva Janžurová, Jiří Hrzán and the director Ladislav Smoljak in a small role also appeared in this film. 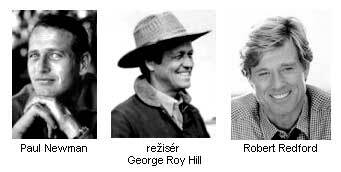 In the same year, 1972, the cameraman partnered for the first time the American director George Roy Hill (1921-2002) who became famous thanks to Butch Cassidy and the Sundance Kid. The leading roles were played by Paul Newman and Robert Redford. The director made Slaughterhouse-Five after the book by the American writer Kurt Vonnegut. Having worked as a slave labourer at a slaughterhouse in Dresden during the Second World War, he experienced Allied bombing. He told about his experience in Slaughterhouse-Five. Thanks to this film the director G.R. 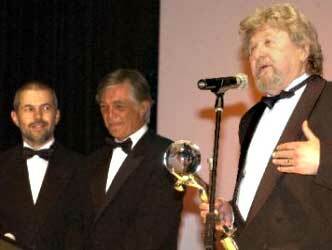 Hill was nominated for a Golden Palm at the film festival in Cannes, but in the end he won the prize of the jury. A compatriot of Miroslav Ondříček, the actor Friedrich von Ledebur (1900-1986), also starred in this film. I don’t know whether Mr Ondříček was aware of this then but Count Ledebur had some very interesting ancestors. The celebrated garden under the Prague Castle is named after his family. The actor’s grandfather was the Austrian-Hungarian minister of agriculture in the years 1895-1897, who owned the estates Kostomlaty, Kremýž and Milešov. Because of his wife (grandmother of Friedrich von Ledebur) Karolína Czerninová, the architect of the Černín Palace Humprecht Jan Czernin is one of the actor’s ancestors. Duke Albrecht of Wallenstein and Emperor and Czech King Charles IV are other notable ancestors of Friedrich. Thanks to Charles’s mother all the Premyslid kings are related to von Ledebur. Towards the end of his acting career Friedrich von Ledebur also played in Federico Fellini´s film Ginger and Fred in the role of Admiral Aulenti. In 1973 Miroslav Ondříček worked on his third film with Lindsay Anderson, O Lucky Man!, starring the British actor Malcolm McDowell. This actor was born in 1943 and his most famous films were Caligula, Royal Flash and Clockwork Orange. He has been friends with Miroslav Ondříček for more than thirty years. He participated in O Lucky Man! as co-producer. At the early 1970s Miroslav Ondříček received an offer to cooperate on a film with George Roy Hill as well as with Miloš Forman but the era of normalisation had begun in Czechoslovakia and Ondříček wasn’t allowed to travel abroad. Hill shot his legendary film The Sting with the cameraman Surtees in 1973 and Forman’s Oscar-winning film One Flew Over the Cuckoo´s Nest was shot by Haskell Wexler in 1975. Miroslav Ondříček shot two Czech films in 1974. Televize v Bublicích aneb Bublice v televizi (Television in Bublice or Bublice on Television). Its premiere was on 1.9. 1974 and the premiere of Drahé tety a já (Dear Aunts and Me) was on 1.5.1975. The directors of the films were Jaroslav Papoušek and Zdeněk Podskalský. He worked on two films a year during the next two years. In 1975 it was Hřiště (The Playground) by Štěpán Skalský, the premiere was on 1.2.1975, Karel Steigerwald participated in the screenplay and Martin Kratochvíl composed the music) and film Dvojí svět hotelu Pacifik (The Double World of Pacific Hotel) in Polish coproduction (director Janusz Majewskij, premiered on 1.1.1976). 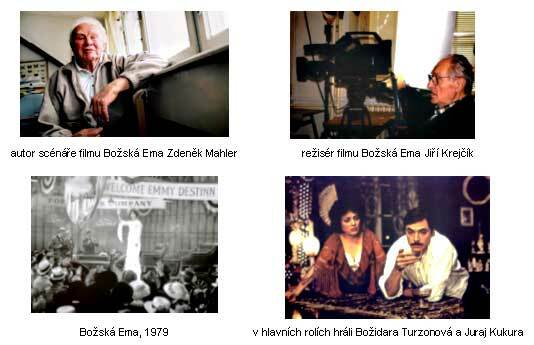 In 1976 it was Konečně si rozumíme (At Last We Understand One Another) by the director Jaroslav Papoušek, the premiere was on 1.2.1977, and Jakub by the directors Ota Koval and Jaroslava Vošmiková (premiered on 1.3.1977) The leading child’s role was played by the future director Filip Renč with Eva Olmerová singing. In 1977 he made a film with the doyen of the Czech directors, Otakar Vávra. The story is about love and honour (premiered on 1.1.1978). It is about a brief love affair between the poet Jan Neruda and the writer Karolína Světlá. The audience could see Božidara Turzonová and Jiří Bartoška in the principal roles. 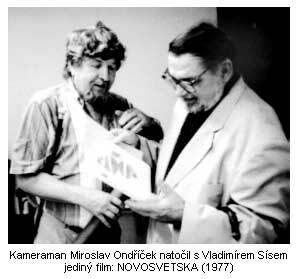 Ondříček and his friend, the director Vladimír Sís, have made together only one film, the TV musical Novosvětská (The New World Symphony), in 1977. In 1978 he cooperated again with the director Ota Koval. This time it was the film Nechci nic slyšet (I Don’t Want To Hear Anything). Its premiere was on 1.6.1978. Filip Renč appeared again in the leading child’s role. The music was composed by Jiří Stivín. Miroslav Ondříček met Karel Smyzcek while making this film after many years. Karel worked as the assistant of the director on this film. In 1960 Karel, who later became a director, played the leading child’s role in a film by František Vláčil called Holubice (The Dove). The shooting of Hair was a meeting of the cameraman Miroslav Ondříček and director Miloš Forman after a long time. They both visited Cannes with the film version of the famous Broadway musical which film opened the international festival. ‘We were leaving the hall on a red carpet, the music was playing, the reporters and photographers were everywhere and we were marching in the parade of hippies – the actors dressed in the costumes from the film. Miloš, the producer and the actors, they all entered the stage of the festival, where suits by Armani dominated for years… That day I saw Miloš make the world´s record when he gave more than fifty interviews during one afternoon. Each interview at a different table with different journalists from different countries.’ These are the memories of Miroslav Ondříček. 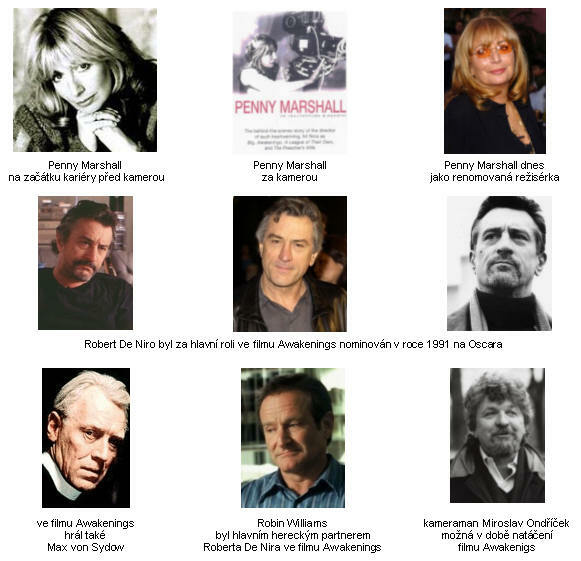 The Czechoslovak premiere was on 1.5.1989, ten years after the world premiere. The second film that Miroslav Ondříček shot with Otakar Vávra had a premiere on 1.9.1980. It was called Temné slunce (Dark Sun) and was based on the novel Krakatit by Karel Čapek. Miroslav Ondříček didn’t finish the film because of an injury he sustained during the shooting. By 1980 he was working again with Miloš Forman. This time it was a film based on the novel Ragtime by E.L. Doctorow. The leading role was played by the legendary American actor James Cagney (1899-1986). Small roles in the film were given to the Czech exile actors Pavel Landovský and Jan Tříska. During the shooting of the film Miroslav Ondříček was ceremonially admitted as a member of the American Association of Cinematographers. In 1982 the film won eight Oscar nominations, with Miroslav Ondříček for the camera. The award-giving ceremony took place on 29.3.1982 in the pavilion of Dorothy Chandler in County Music Center, Los Angeles, California. Henry Fonda received an Oscar for the leading role and Paul Newman and Burt Lancaster were nominated, too. In the contest for the top billing Katherine Hepburn defeated Meryl Streep. The World According To Garp by John Irving is a famous book today, having achieved cult status in some circles. It is a fantastic story as well. ‘I met my friend George Roy Hill again and I met also many great actors. 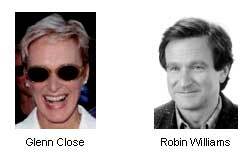 The role of Mother was played by Glenn Close, the leading male role was given to Robin Williams. These were their first major roles and thanks to this film they became successful very fast,’ as Miroslav Ondříček says about The World According To Garp made with the director G.R. Hill in 1982. In 1983 Miroslav Ondříček made Silkwood with an experienced director, Mike Nichols. Mike was in 1967 nominated for an Oscar for the direction of Who’s Afraid of Virginia Woolf. Silkwood was based on a true story. Meryl Streep played the leading role and her partners were Kurt Russell and Cher. In 1984 Streep, Nichols and Cher were nominated for an Oscar. Amadeus is probably the most famous production that Miroslav Ondříček has worked on. Director Miloš Forman shot most of it in Czechoslovakia in 1984. The Vienna scenes were shot in Prague. 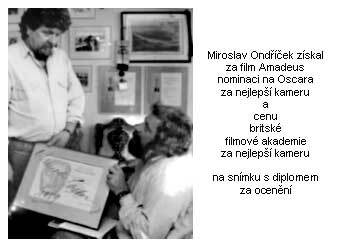 The film won eight Oscars and Miroslav Ondříček was nominated for the second time, but the 1985 Oscar went to Chris Mengers. 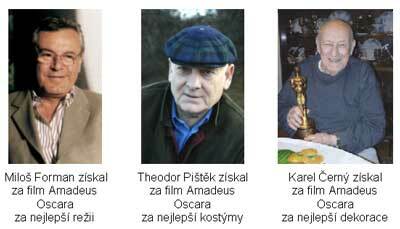 Miloš Forman was not the only Czech to win an Oscar for his work. The architect Karel Černý and the costume designer Theodor Pištěk received this award. Miroslav Ondříček got a film award from the British Academy of Film and Television Arts (BAFTA). He was nominated nine times in 1986. Another famous name that attracted the interest of the designer Petr Sís after he had created picture books about Galileo and Darwin was Wolfgang Amadeus Mozart. It wasn’t the first encounter with this personality. Mozart was involved when the designer left his homeland to make it with his art in the USA. When Miloš Forman was making Amadeus he had the poster designed by Sís. This work was then one of the first steps to the American career of Sís. He earned for the poster enough money to be able to move from California to New York, where he finally found a job. Petr Sís was not the only Czech who participated on the creation of Amadeus. Many actors played in it. Miroslav Sekera played the young Mozart, Karel Fiala played Don Giovanni, there were also Hana Brejchová, Miriam Chytilová, Karel Effa, René Gabzdyl, Karel Hába, Aťka Janoušková, Jiří Krytinář, Jiří Lír, Jitka Molavcová, Pavel Nový, Jan Pohan, Tereza Pokorná, Dana Vávrová. The screenwriter Zdeněk Mahler played the cardinal and the director Vladimír Svitáček played Pope Clement XIV. Václav Rouha, Jan Balzer, Václav Eisenhamer were some of the producers. Directing cooperation was Jan Schmidt, Jan Kubišta, Petr Makovička, Tomáš Ťintěra and Mirek Lux. The assistants of Miroslav Ondříček were Miroslav Čvorsjuk, Jiří Krejčík, Michal Krob. Zdeněk Mahler was the history consultant. The piano solo was played by the virtuoso Ivan Moravec. And we must not forget the electricians Luboš Šimeček, Jaroslav Sinkule, and many other professionals. In 1985 the young director Michael Dinner asked Miroslav Ondříček join him in the making of a film. Dinner received a prize in Cannes for a student film and then he wrote a screenplay about Catholic education. Miroslav Ondříček accepted the offer and shot with Michael the film Heaven Help Us. The leading role of Brother Thadeus was played by the Canadian-born Donald Sutherland. Another film he shot was F/X, which the young director Bob Mandel made in 1986. As an aside, Dodi Al Fayed was one of the producers. 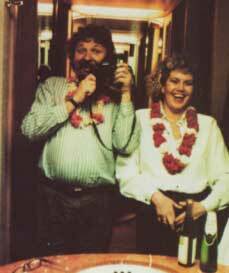 He died in a car crash in Paris with British Princess Diana. He was planning a big project with Miroslav Ondříček. The documentary Distant Harmony was about the first stay of the Italian opera singer Luciano Pavarotti in China. It was shot by the American director Sage de Witt and Miroslav Ondříček in 1987. The Czechoslovak premiere was on 1.1.1990. During the shooting in China Miroslav Ondříček met the director Robert Mandel and they decided to shoot another film together. Thus Big Shots saw the light of day in 1987 but it didn’t succeed as they had dreamed and hoped. They wanted to enter the world of Mark Twain on the Mississippi, telling a story of the friendship between a black and a white boy. But the producer’s ideas were somewhat different. In 1988 Ondříček cooperated on the shooting of a third film with George Roy Hill. It was called Funny Farm. Andy, a man from a big city, and his wife Elisabeth move to the country, where they don’t belong at all. Ups and downs of the life in the country bring them soon many problems so they decide to get divorced and sell the house. The meeting of George Roy Hill and Chevy Chase was a great experience for comedy fans. In 1989 he was working with Miloš Forman again, this time on Valmont. This free adaptation of the novel Les Liaisons dangereuses by Choderlos de Laclos was a Franco-British coproduction and the film received the French prize Cesar. Theodor Pištěk participated as a costume designer and the Czechoslovak premiere was on 1.3.1991. In 1990 cameraman Miroslav Ondříček cooperated for the first time with the American director Penny Marshall. He met again the actor Robin Williams on the set of Awakenings. Williams played the role of Dr Malcolm Sayer. The main character Robert de Niro was nominated for an Oscar as the best actor. The plot of the film is clear from the slogan: Robert de Niro in the main role of American film about people who are awakened after many years of sleeping. 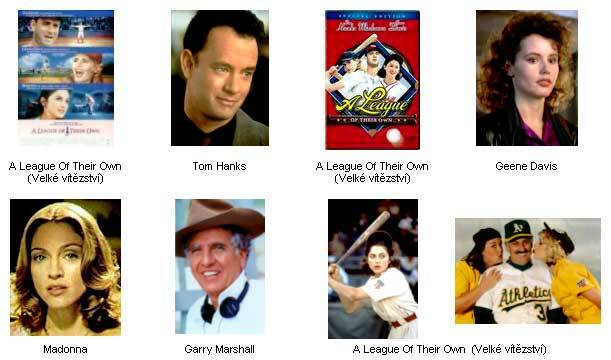 Another film he shot with Penny Marshall was called A League Of Their Own. It was made in 1992. The film took Miroslav Ondříček a lot of effort because he was working under very difficult and unusual conditions for a European. Sweltering heat up to 50 degrees, 100% humidity of the air… During the Second World War all professional baseball players had to join the army and the idea of a women’s baseball league was born, in a brief version of the story. The leading roles in this American film comedy were given to Tom Hanks, Geena Davis and Madonna. The brother of the director played there too. He also became a director and his name is Garry Marshall. In 1990 he directed the famous film Pretty Woman with Julia Roberts and Richard Gere in the leading roles. In 1995 the cameraman was asked by the debuting director Eleanor Bergstein to shoot a music and dance film. It was called Let It Be Me. 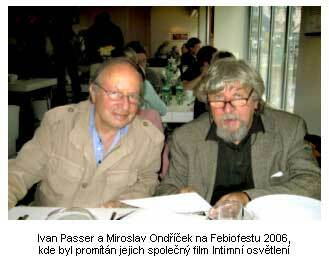 A year later (1996) Miroslav Ondříček made his third film with Penny Marshall called The Preacher’s Wife. In fact, it was a remake of a black-and-white film with Cary Grant. These films are usually played on TV at Christmas time. 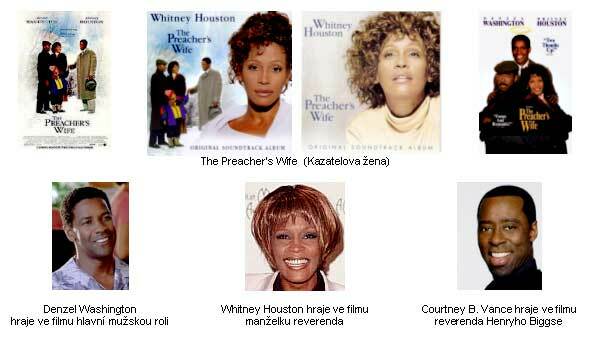 In the leading roles were Denzel Washington and Whitney Houston. It should have been a Christmas tale for Afro-Americans, according to the producers. But the film perhaps should resembled more a fairy tale. In the year of his 70th birthday Miroslav Ondříček received an international award for his life’s work from the American Society of Cinematographers (ASC). He accepted the award with mixed feelings. The same year he received a prize for his lifelong contribution to the world’s cinematography at the international film festival in Karlovy Vary. Apart from other prizes, he received a Czech Lion for long lasting contribution to the Czech film (2000), and an award for lifelong work from the Association of Czech Cameramen (2005). ‘To get an award in your homeland is always most difficult. Sometimes the awards come from abroad, but it takes time before recognition from home arrives,’ he says. On the occasion of the national holiday of the Czech Republic Miroslav Ondříček received on 28.10.2006 at the Prague Castle a Distinguished Service Medal from the hands of President Václav Klaus. Tento článek byl v Pozitivních novinách poprvé publikován 04. 11. 2006.